Crater Tindr on Callisto - an Oblique Impact? 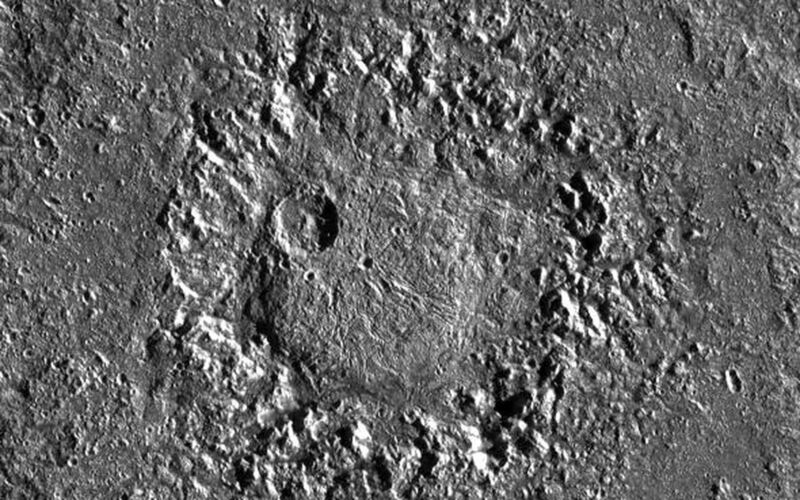 This image shows crater Neith, an unusual impact structure about 160 km (100 miles) in diameter, situated on Jupiter's largest satellite, Ganymede. 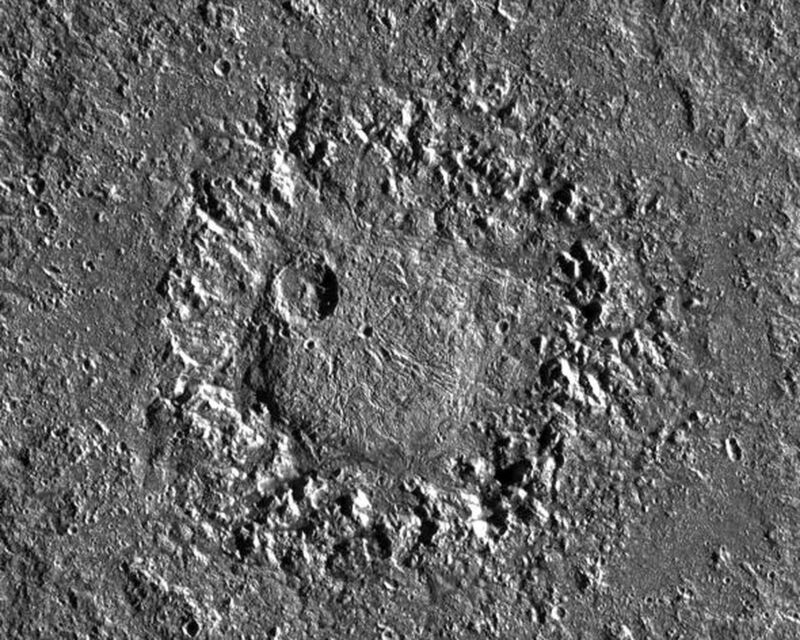 Impact features like Neith have been called "penepalimpsests" by some investigators or "dome craters" by others and are considered to be transitional between craters and palimpsests. 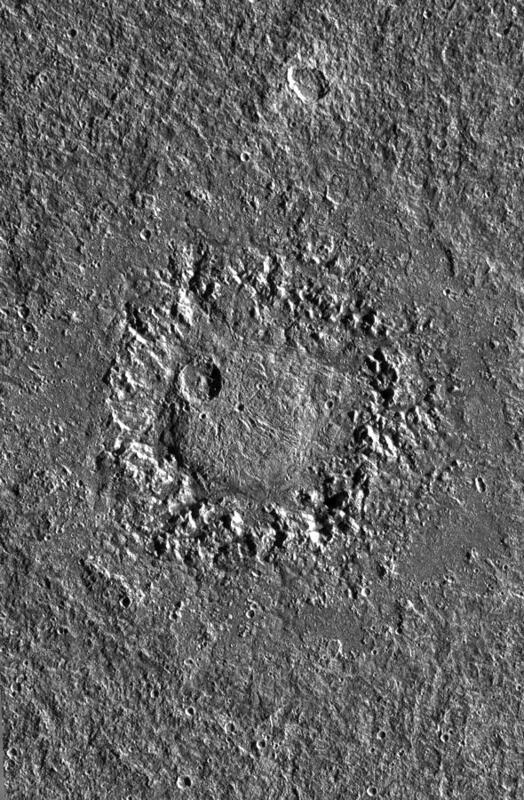 Palimpsests are bright, nearly circular patches that are believed to be remnant impact features. They occur also on Callisto, Ganymede's neighbor farther distant from Jupiter. Four images of Neith were obtained under low sun elevation in April 1997 during Galileo's 7th orbit around Jupiter with the Solid State Imaging (SSI) system from a distance of about 15,500 km (9,600 miles) to produce this mosaic. The pixel resolution is about 150 m/pixel - the smallest features that are still discernible are about 300 m across. The sun illuminates the scene from the right. North is approximately pointing towards the top of the mosaic. Neith is situated at about 29 degrees northern latitude and 9 degrees western longitude on Ganymede. The most striking feature in Neith is a large, circular dome about 45 km in diameter. The dome is surrounded by a wreath of rugged terrain. The wreath does not represent the original crater rim but the rim of a large central pit instead. 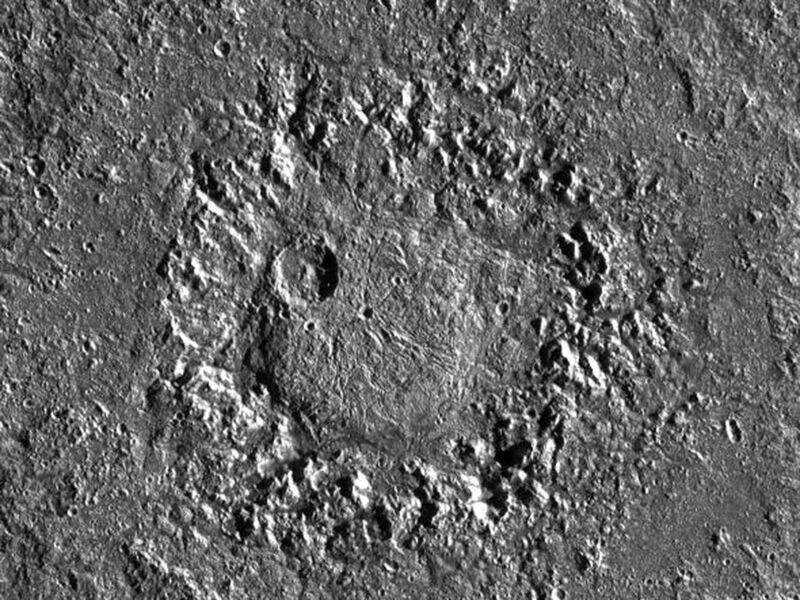 The rim itself is barely visible and is located along the outer boundary of a relatively smooth, circular area, assumed to be the crater floor, which in turn surrounds the wreath of rugged terrain. In some parts along the rim, inward-facing scarps may be seen. The rim is not circular but appears to be petal-shaped. Outside the rim, a continuous ejecta blanket may be discerned. The morphology of impact features such as Neith results either from the response of a relatively weak target material to a high-energy impact or from long-term viscous relaxation of the surface subsequent to impact. Absolute ages derived from crater frequency measurements are model-dependent. In one crater chronology model, based on impacts dominated by asteroids, Neith may be old and very likely was formed during a period of more intense bombardment than today, about 3.9 billion years ago. In a different model, based on impacts preferentially by comets with a more or less constant impact rate, Neith may be only about 1 billion years old.